I picked this up because of my love for Knizia and I’m glad to say that I really like it. As with many Knizia games the theme is almost pointless, but it helps to have SOMETHING to explain why you’re placing things on the board in the way you are. The goal of the game is to get the most points and you get points in a variety of ways. You can get points by having the longest chain of camels of certain camels, landing your camels on Waterholes, landing next to Oases and by blocking off sections of the board. The game has been compared in my game group as a variation on Go, with the area control being similar. I can’t speak to this since I haven’t played Go, but from what I understand of the game that makes some sense. However unlike in Go each player commands 5 different colors, not just one. All the colors are nice pastels and are fairly easy to tell apart from each other. However I don’t know how well they work for the colorblind. I think they’re different enough to tell apart, there’s been no trouble in my gaming group on the occasions of play. On your turn you place any two camels you want. They can be different colors or the same color, but they must be placed next to other camels you control already. At the start of the game you place your Caravan Leaders on the board and those are your starting pieces for each of the 5 colors. Overall I really enjoy this game. It’s fairly quick to learn but you’ll keep playing because you keep going back to try out new strategies. Probably more of a Gateway Game than a deep thinking I find this one game that works well for all player ranges 2-5. 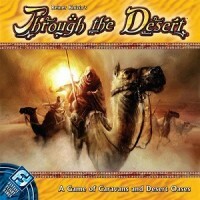 Add a Review for "Through the Desert"